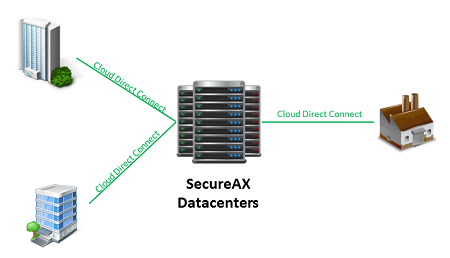 SecureAX Cloud Direct Connect allows dedicated private network to be connected to our datacenters in Singapore or Thailand, from your office, manufacturing plants, warehouse or datacenter. By using Cloud Direct Connect, our customers get to enjoy an enhanced security, guaranteed stability and speed whilst accessing to the Cloud Services from their on-premise environments. We are able to partition the dedicated private network into multiple Virtual LAN (VLAN). This allows you to use the same connection to access the full range of our Public and Private Cloud solutions for your business needs.